From a shortlist of 10 highly commended breakthroughs, the historic achievement by scientists working on the Rosetta mission was singled out by the Physics World editorial team for its significance and fundamental importance to space science. The landing of the Philae probe, which captivated not only the physics community but millions of people worldwide, was the culmination of 10 years' work by scientists at the European Space Agency (ESA), who successfully guided the Rosetta spacecraft through the inner solar system to finally meet up with Comet 67P/Churyumov-Gerasimenko in August. 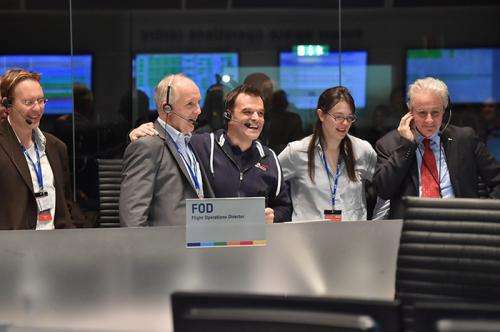 At 15:35 GMT on 12 November, a signal was received in the ESA control room confirming that the Philae lander had completed its seven-hour descent and had landed safely on the surface of Comet 67P. While the landing was not as smooth as mission scientists would have liked, the Philae lander still managed to collect a large amount of data before entering hibernation mode. To celebrate the achievement, Physics World will be hosting a Google Hangout with members of the Rosetta team on Friday 12 December at 14:00 GMT. Dr Hamish Johnston, editor of Physics World says: "By landing the Philae probe on a distant comet, the Rosetta team has begun a new chapter in our understanding of how the solar system formed and evolved - and ultimately how life was able to emerge on Earth. As well as looking forward to the fascinating science that will be forthcoming from Rosetta scientists, we also acknowledge the technological tour de force of chasing a comet for 10 years and then placing an advanced laboratory on its surface." The Physics World editorial team has recognized a further nine achievements from 2014 in a range of topics from nuclear physics to nanotechnology. The top 10 breakthroughs were selected using the following criteria: fundamental importance of research; significant advance in knowledge; strong connection between theory and experiment; and general interest to all physicists. Dr Johnston continues: "In what was an exciting year for the field of physics, we commend the work of the nine runners-up, each of which represents an important step forward made by a team of creative and talented researchers. Our congratulations are extended to all of those involved." To Sebastiano Cantalupo, Piero Madau and Xavier Prochaska of the University of California Santa Cruz and Fabrizio Arrigoni-Battaia and Joseph Hennawi of the Max-Planck-Institut für Astronomie in Heidelberg for using the radiation given off by a quasar to catch the first glimpse of a filament of the cosmic web. Matter in the universe is not uniformly distributed and exists in a web of filamentary structures with intervening voids. This web is thought to have formed about 380,000 years after the Big Bang and its presence is a widely accepted theoretical prediction. While we can see matter where it has agglomerated into dense objects such as galaxies, astronomers had not seen the whispy filaments of cold gas. Now, Cantalupo and colleagues have spotted radiation emitted by this gas when it absorbs ultraviolet light emitted by a quasar. The research already suggests that the filament is more "lumpy" than expected, and future measurements using other quasars promise to give much more information about the early universe. To the Borexino collaboration for being the first to detect neutrinos from the main nuclear reaction that powers the Sun. Nearly all of the energy generated in the Sun involves a chain of nuclear reactions that begins with two protons fusing together to form deuterium along with a positron and a low-energy neutrino. Calculations predict that about 60 billion of these neutrinos pass through a square centimetre on Earth every second, but low-energy neutrinos are particularly difficult to detect and so the theory could not be verified. Now, deep under the Gran Sasso mountain in Italy, some of these neutrinos have been detected by spying the flashes of light that occur when the neutrinos collide with electrons in a giant tank of liquid. The Borexino team was not actually expecting to see these neutrinos, but its detector was so well built that the researchers managed to measure a flux of 66±7 billion neutrinos per square centimetre, confirming the long-established theory of solar fusion. To Omar Hurricane and colleagues at the National Ignition Facility (NIF) of the Lawrence Livermore National Laboratory and the Los Alamos Laboratory in the US for being the first to obtain a "fuel gain" of greater than one in a laser-driven nuclear fusion experiment. Nuclear fusion promises to deliver vast quantities of clean energy, but physicists working on various experiments have made very slow progress towards this goal. Now, Hurricane and colleagues have used NIF's ultra-powerful laser to crush tiny pellets of deuterium–tritium fuel to produce more energy from fusion reactions than was deposited in the fuel. This comes after a five-year struggle to boost the amount of fusion energy given off in the process. The team focused on achieving a stable compression of the pellets, and on one occasion was able to achieve more than 2.5 times fusion energy out than laser energy in. Much of this energy is in the form of "alpha-particle heating", which is essential to achieve "ignition", whereby energy released from fusion causes more fuel to fuse. Although still far from the long-sought-after goal of ignition, the latest results are an important step towards fusion energy. To Christine Démoré and Mike MacDonald of the University of Dundee in the UK, Patrick Dahl and Gabriel Spalding of Illinois Wesleyan University in the US and colleagues for creating the first acoustic "tractor beam" that can pull an object by firing sound waves at it. A staple of science fiction, a tractor beam seems to defy physics by pulling an object towards the source of an outgoing beam that carries momentum. The acoustic tractor beam built by Démoré, Dahl and colleagues involves firing two beams of ultrasonic waves at an object. The beams have circular wave fronts that curve around the direction of propagation and so carry angular momentum. When the wave front strikes the target, the angular momentum is redirected as regular momentum. Some of this momentum will be redirected in directions such that the result is a net inward force on the object, pulling it towards the source. The ultrasonic beams were created using a commercial array of ultrasound sources, and the technique could have a range of applications in medicine. These include manipulating objects, fluids and tissue inside the body, and delivering encapsulated drugs to the exact location in the body that requires treatment. To Gianluca Gregori, Jena Meinecke of the University of Oxford and an international team for using one of the world's most powerful laser facilities to create tiny versions of supernova explosions in the laboratory. Supernovae are massive stellar explosions that leave behind hot, dense clouds of dust and gas that are often beautiful in appearance. One particular remnant, Cassiopeia A, has long puzzled astronomers because of its irregular knotty structure that suggests the presence of very strong magnetic fields. This supernova was simulated by Gregori, Meinecke and colleagues, who fired three laser beams onto a tiny carbon rod in an argon-filled chamber. The exploding rod creates an asymmetric shock wave that expands outwards through the argon gas, much like a real supernova in space. A plastic grid, which simulated a "lumpy" distribution of gas in the region of the supernova, was placed in the path of the shock wave, and the result was strong magnetic fields similar to those observed in Cassiopeia A. The technique could also be used to simulate a range of astrophysical processes, say the researchers. To Shlomi Kotler, Nitzan Akerman, Nir Navon, Yinnon Glickman and Roee Ozeri of the Weizmann Institute of Science in Israel for being the first to measure the extremely weak magnetic interaction between two single electrons. Since the 1920s, physicists have known that the electron possesses an intrinsic spin angular momentum and associated magnetic moment. Although researchers have measured the magnetic field of an individual electron, the magnetic interactions between two electrons have proved much more difficult to observe. Magnetic interactions are at their strongest when two electrons are separated by atomic-scale distances, but cannot be measured because other forces dominate the scene. While these other effects weaken as the electrons move further apart, so does the magnetic interaction, which is then lost in noise. Kotler and colleagues overcame these problems by putting two electrons in a long-lasting entangled state, which guarantees a low-noise environment. They were then able to measure the force between the electrons by using a laser to determine whether the electron spins were parallel or antiparallel. To Arash Mafi and colleagues at the University of New Mexico, University of Wisconsin-Milwaukee, Corning Incorporated and Clemson University for using the phenomenon of "Anderson localization" to create a better optical fibre for transmitting images. Disorder in an optical fibre usually blurs transmitted images, but Mafi and colleagues have shown that by putting the right kind of disorder in the right place, the ability of a fibre to transmit sharp images can be enhanced. Indeed, their prototype produced a sharper image than the best available commercial imaging fibres. The technique involves using Anderson localization, whereby light will not propagate through a medium with a certain degree of disorder. The team created a fibre made of 80,000 strands of two different materials that are positioned randomly next to each other. The result is disorder in the directions transverse to the length of the strand and order in the direction that the light propagates. To Alexander Khitun and Frederick Gertz at the University of California Riverside in the US and Alexander Kozhevnikov and Yuri Filimonov at the Kotel'nikov Institute of Radioengineering and Electronics in Russia for creating a new type of holographic memory device based on the interference of spin waves. Holography involves reflecting a beam of light from a 3D object and recording the interference pattern that occurs when it is mixed with an identical beam that did not strike the object. It has the potential to store and retrieve large amounts of information in a very efficient way, but the storage density is limited by the wavelength of the light. The spin waves used in Khitun and colleagues' magnetic holography device have much shorter wavelengths than visible light, and could therefore be used to store data at higher densities. The prototype device comprises two tiny magnets connected by magnetic wires. Data are saved by sending large-amplitude spin waves through the wires to flip the orientations of the magnets. Data are read by sending smaller-amplitude waves through the device and measuring how they interact with the magnets. To Aephraim Steinberg and colleagues at the University of Toronto for being the first to demonstrate a quantum analogue of data compression in the lab. Conventional data-compression schemes cannot be applied to quantum information because they involve measuring the values of the data bits to be compressed – a process that destroys quantum information. In 2010, however, physicists in the Czech Republic worked out that a string of identically prepared quantum bits could be compressed, albeit not as tightly as conventional data. Now, Steinberg and colleagues have done this in the lab, and have squeezed the quantum information carried by three photon-based quantum bits into two. The technique could pave the way for a more effective use of quantum memories – which are not easy to create – and offers a new method of testing quantum logic devices. Not to be technical but is it a "breakthrough"? I thought that phrase was used when a jump in our understanding of something in the field of science had occurred. Not to diminish the amazing feat of course. I quite agree. "Breakthrough" doesn't work at all for me. First, it's 100% technology isn't it? It is certainly not fundamental physics. And it's just a set of measurements which will soon be bested and forgotten. I agree that it's a wonderful technological achievement. But I don't think it belongs in any top ten list unless it's a list of technical achievements but I stll wouldn't characterize if as a "breakthrough" in any sense. After all we landed on the moon didn't we and with measurably cruder tools.